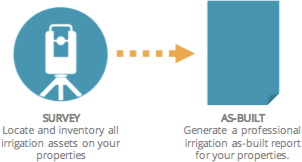 with a mobile/cloud solution specifically designed for the residential and commercial irrigation maintenance process. 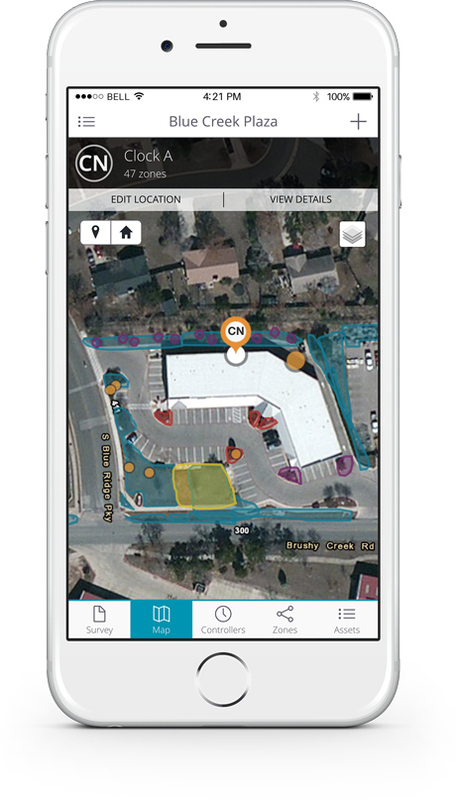 Use the built-in GPS of your mobile device along with the Survey application to identify and locate all of the irrigation assets as you walk the property. From within Survey, you can create a professional as-built report of the property that includes includes a property overview map, detailed asset maps, and a comprehensive index with pictures and other asset information for a complete reference. Sell the as-built report to your client or offer it to them as a differentiator of your professional services. 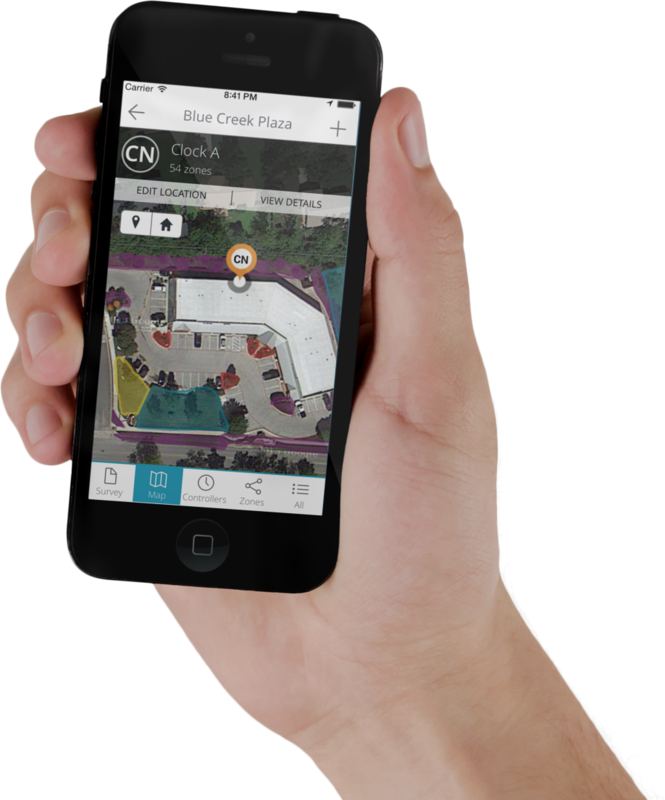 Eliminate the use of paper in the field by capturing all of your walk-thru information with a mobile device and the Inspect application. Your field technicians can quickly identify specific irrigation services for each type of asset, add photos, and other specific information about the service to better communicate to your client and technician the work that needs to be performed. Each specified service automatically calculates the associated labor and materials costs that will accurately represent the expected costs of the repairs. The detailed inspection report can either be used internally, or can be shared directly with your client. The combination of all Tapigo® applications can be used throughout your organization to streamline the entire maintenance life-cycle. Does it take too long from inspection to payment? With Tapigo, your maintenance cycle time can be reduced from weeks to days. Tapigo® Configure provides a fast and easy way to setup and administer your company data to be used throughout the Tapigo® solution. 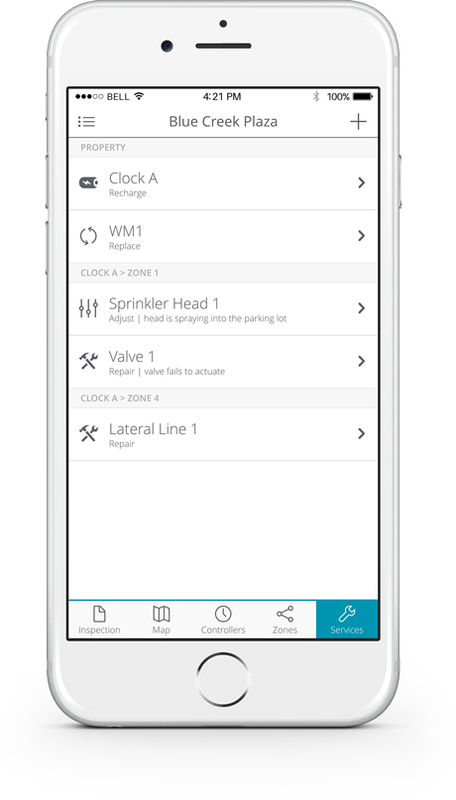 With Configure, you can maintain all relevant irrigation maintenance data including clients, properties, employees, labor and materials rates, and more. As with all Tapigo® apps, your data is securely maintained in the Tapigo® Cloud and can only be shared with the employees, partners, and clients to whom you provide access. With Configure, you can stay in control of your data and processes to get the most value out of the Tapigo® solution. Tapigo® Survey is the most comprehensive irrigation asset inventory and location tracking application available. With Survey, you can identify all irrigation assets for a property including controllers, zones, valves, meters, sensors, pumps, and more. 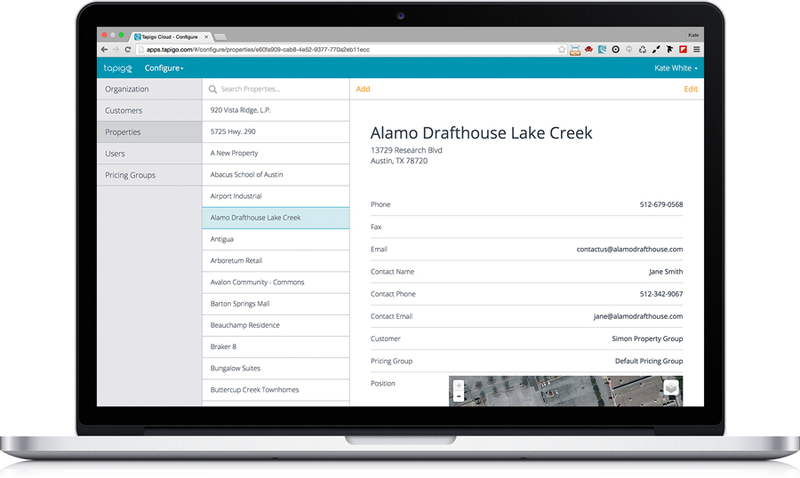 For each asset, you can specify a name, description, manufacturer, model, photos, map location, and even the relationships between assets. With Survey, you can conduct faster irrigation asset inspections, ensure broader and more consistent knowledge of irrigation assets, improve communication with your clients and conduct repairs with a broader group of technicians. You can also generate an As-Built report for each property that you have surveyed. Take Tapigo® Survey for a test drive by clicking the Try It Here button below. Tapigo® Inspect is the most comprehensive irrigation inspection and service tracking application available. With Inspect, you can routinely check the working condition of every irrigation asset for a property including controllers, zones, valves, heads, bubblers, drip lines, and more. For each identified repair or service, you can specify the service type, description, photos, map location and even indicate whether the damage was caused by the crew. Each added service calculates the estimated labor and material costs. At the conclusion of the walk-thru, you can generate an inspection report that can be shared with your client. With Inspect, you can conduct faster irrigation inspections, ensure contract compliance, capture all of the relevant information to get the repair or maintenance done properly the first time and improve communication with your clients. Take Tapigo® Inspect for a test drive by clicking the Try It Here button below. Tapigo® Approve allows for the account manager to review and approve, deny, or delay each identified service item for a property. With Approve, you can act on behalf of your client in the approval step of the irrigation maintenance process immediately after the onsite inspection. With service item control, your client will be able to indicate exactly what they want done and will understand the detailed costs before work begins. 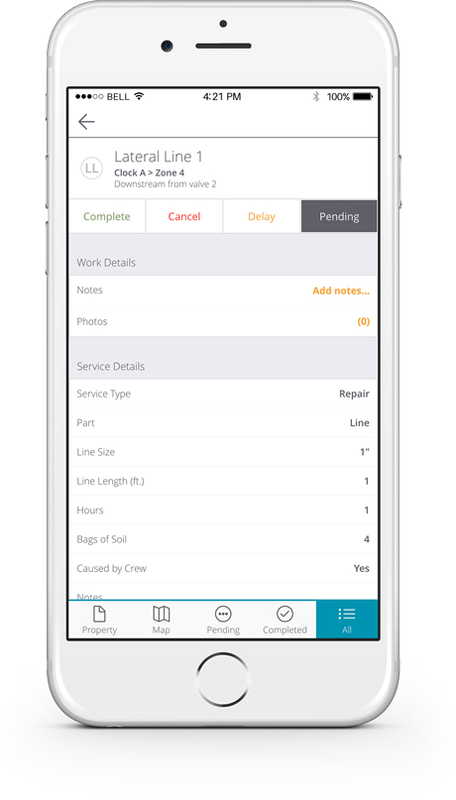 With Approve, you can shorten the cycle time between inspection and repairs, improve communication with your clients and improve customer satisfaction by giving them complete control over each identified repair or service. Take Tapigo® Approve for a test drive by clicking the Try It Here button below. Tapigo® Work allows for the irrigation technician to review and complete, remove or delay each approved service item for a property. With Work, you enable any qualified technician to perform only the specific services that have been approved by your client, with all of the information needed to perform the service correctly the first time. The technician has visibility not only to each specific service item, but a list of materials and estimated labor time needed to conduct the service. As each task is performed, the technician can mark it as complete and document actual time and materials as well as any needed notes or photos. With Work, you can increase customer satisfaction by getting the job done correctly every time, conduct repairs with a broader group of technicians, shorten the cycle time between inspection and repairs, and improve communication with your clients with more detailed and timely information. Take Tapigo® Work for a test drive by clicking the Try It Here button below. Tapigo® Invoice allows for the office manager to review and invoice, credit, or delay each completed service item for a property. With Invoice, you can be assured that all of your completed services have been correctly billed and with actual time and material costs applied that were captured at the point of service. Tapigo® directly links the activities in the field with the back office to minimize paperwork, administrative costs, and time to invoice. And with granular service tracking, you can provide unmatched transparency throughout the irrigation maintenance process with your clients. With Invoice, you can increase revenue by ensuring that all completed service work is accurate when billed, speed collections by enabling faster billing cycles, and improve on-going communication with your clients with more detailed and timely information. Take Tapigo® Invoice for a test drive by clicking the Try It Here button below. Could you be doing more inspections/repairs? With Tapigo, your technicians can generate more revenue because they aren’t in the office doing paperwork. By streamlining the process, you can accomplish two or more inspection/repair cycles per property per season with your existing book of business. By eliminating manual, paper-based processes, you can focus your technician’s time on billable work rather than administration. By standardizing the workflow and eliminating the manual administration required, your profit center can grow beyond your current book of business. With a seamless flow throughout the service process, you can significantly reduce your DSO (Days Sales Outstanding). With better tracking and reporting, you can keep your clients aware of the frequency of inspections and the associated services identified and performed. Is the inefficiency of your irrigation process restricting your growth? With Tapigo, your team can do more enabling you to increase your book of business. You and your staff can try out Tapigo® free for 1 month. We’ll help you get the most out of your evaluation by providing you an on-boarding specialist who can assist your staff with training and answer all of your questions. As you near the end of your trial, you will receive email notifications reminding you to enter your credit card information. You will then be billed one month later based on your usage throughout that month. As always, you have the option to cancel at any time. Are you being paid for all of your work? 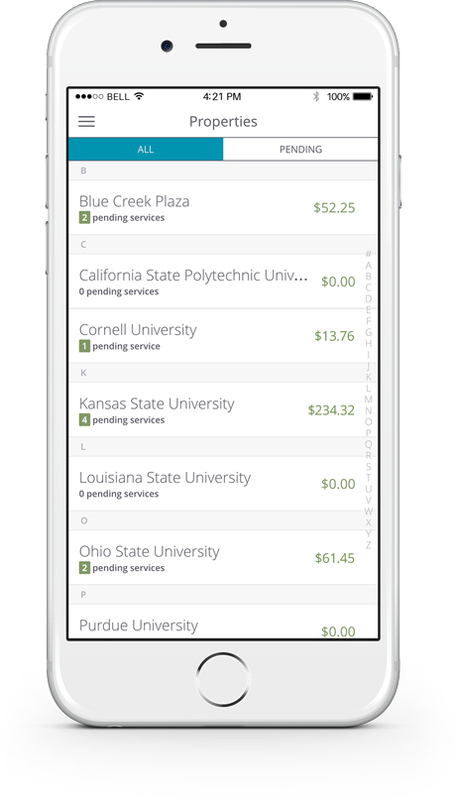 With Tapigo, all of the services identified and performed are tracked with actual labor and materials until they have been invoiced. Technology is an important part of my growth strategy. Tapigo fills the gaps in my other solutions and has been a significant differentiator for me in being able to provide an increased level of professionalism and transparency with my clients. By adding electronic inspections, I grew my irrigation maintenance revenue by 80% year over year with the same book of business by being able to increase the number of inspections. I'm looking forward to seeing what we do this year using the entire Tapigo solution. Do your clients trust your level of service? With Tapigo, it is easier to be transparent with your clients and the details associated with your service. We are passionate about helping small businesses better compete and grow with technology. We have spent our careers developing web, mobile, and cloud-based enterprise solutions and have engineered a sophisticated and cost-effective platform on which you can confidently run your business. We also recognize that no technology can benefit your business unless the field organization embraces the solution they use to do their jobs. To that end, all of our solutions are designed specifically for each profit center with processes, terminology, and pricing consistent with your industry’s best practices. We take great pride in the improvements that our solutions provide for our customers and work every day to give small businesses a competitive edge. Our first set of solutions are focused on transforming the Landscape Maintenance industry. Additional profit-center solutions will be released in the coming months. Please keep up with our progress by joining the Tapigo Community. Sign up to receive updates from Tapigo®.